Munich - With the Bundesliga title already won FC Bayern München may have had little to play for on Saturday afternoon, but their Matchday 32 defeat at home to FC Augsburg still hurt. Yes, they'd lost the local derby against their Bavarian neighbours from 80 kilometres down the road, but the pain cut deeper than merely bruised pride. This was Bayern's fourth successive defeat in all competitions: to Borussia Dortmund in the DFB Cup semi-finals; 2-0 away to Bayer 04 Leverkusen last weekend; 3-0 away to FC Barcelona in the UEFA Champions League semi-final first leg last Wednesday, and now this. Furthermore, Pep Guardiola's charges have not found the net since going 1-0 up in the 29th minute against Dortmund. 361 goalless minutes (over six hours of play) have passed since then. "We’re not finishing off our chances at the moment," admitted Philipp Lahm afterwards. Bastian Schweinsteiger agreed: "We need to regain our focus in front of goal." The midfielder was one of the few home players to stop and talk to the media on Saturday. Manuel Neuer, Thomas Müller and Mario Götze, among others, are usually happy to offer a word or two, but here they trudged by in silence, heads hanging. As such, the recently redecorated mixed zone - adorned with giant pictures of Thiago and Müller celebrating Bayern's latest Bundesliga title - seemed oddly detached from the current atmosphere. Nevertheless, Guardiola was rightly keen to focus on the positives: "It's not easy to play with ten men for 80 minutes three days after the match in Barcelona, but even then we managed to control the game. We had some clear-cut chances and played well." Indeed, Bayern struck the woodwork twice, with Götze grazing a post in the first half, and Robert Lewandowski brushing the bar after the break. Furthermore, over the 90 minutes the hosts also had 65.1 per cent possession and won 51.5 per cent of all tackles despite being a man down. All of which bodes well ahead of Bayern's second leg against Barcelona on Tuesday, in which they need to overturn the 3-0 deficit from the first leg. Still, it is not an unfamiliar situation, having lost away to FC Porto in the previous round, only to turn on the style when it mattered most at the Allianz Arena, running out 6-1 winners on the night and 7-4 victors on aggregate. "Now we'll recover and start preparing for our semi-final," Guardiola said. "We're already Bundesliga champions and that's the most important thing." That is undoubtedly true, but reaching the Champions League final would be an added bonus. 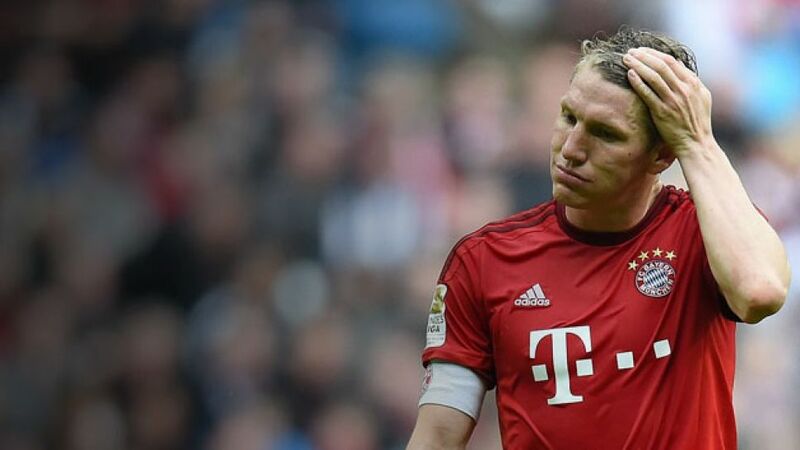 And Schweinsteiger, for one, has not given up just yet: "Sometimes unbelievable things happen in football. I hope we have one of those days on Tuesday."